1. Preheat the oven to 275°F (135°C). 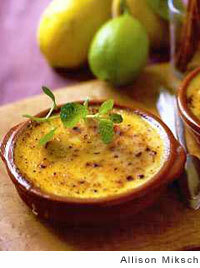 In a medium saucepan, combine the cream, half-and-half, cinnamon stick, nutmeg, and lemon zest. Place over medium heat until small bubbles form around the edges of the pan. Remove from the heat and let cool to room temperature. Remove the cinnamon stick. 2. In a medium bowl, whisk the egg yolks until pale in color, then whisk in the 1/3 cup sugar until dissolved. Whisk in the cream mixture. 3. Place six standard-size flan dishes in a baking pan. Divide the custard mixture among the dishes. Pour warm water into the pan to come halfway up the sides of the dishes. Bake in the oven for 35 to 40 minutes, or until the center of each custard still jiggles slightly. Remove from the oven and lift the dishes from the hot water. Let cool briefly, then refrigerate for at least 2 hours or up to 2 days. 4. When ready to serve, place the dishes on a baking sheet and evenly sprinkle 1 tablespoon sugar over each custard. Using a hand-held blowtorch, caramelize the sugar (see Note). Garnish each dish with a lemon wedge and a sprig of lemon balm or mint, if desired. Use caution and follow the manufacturer’s instructions when using a blowtorch. Searing one dish at a time, hold the blowtorch about 4 inches from the top of the dish, moving the torch constantly so that the sugar (or cheese) browns evenly. Be especially careful if the custard contains alcohol, as it can cause the sugar to sputter. When using a broiler to caramelize, place the dishes about 4 inches from the heat source. Watch carefully and turn the baking sheet holding the dishes if necessary to brown the custards evenly. Wear oven mitts when broiling and handling the baking sheet in the oven. These are easy to make and—with the flavors of cinnamon and lemon zest—are a delicious twist on the regular vanilla crème brûlée. I’ll make this again without hesitation, because it got raves from everyone at the table. Just keep in mind that they might need more than an hour to cook, not 40 minutes if you use warm (not hot) water. 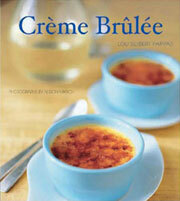 A lightly flavored brûlée that is very simple to make, with pleasing results. Not too sugary, which gives it a bit of a sophisticated air. My husband agreed that they’re as good without the caramelized sugar on top as stated in the recipe’s description. Sadly, I can’t judge this for myself as he ate the last ones! 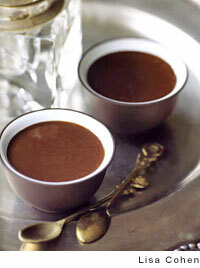 Catalan Cinnamon Crème Brûlée Recipe © 2009 Lou Seibert Pappas. Photo © 2009 Alison Miksch. All rights reserved. All recipes and photos used with permission of the publisher. My guests love crème brûlée and, as usual, asked for a second one. I will make this recipe again.